While we don't consider ourselves hiking pros, we like to add a hike here and there while we travel. So when we heard about Colca Canyon, one of the most recommended hikes in Peru, we added it to our list. Although this trail is super popular amongst tourists, we feel that many decide to hike it without realizing the conditions of the trail. We laugh about it now, but we were almost in tears a few hours into hiking down the canyon, and we want to save you before you get yourself in the trouble we did. This guide will help you prepare for a 3 day hike in Colca Canyon. Colca Canyon is 11,155 ft (3,270 m) deep. This is one of the deepest canyons in the world, and you are about to hike it both down and out. If this doesn’t scare you, nothing will! Like we mentioned before, hiking Colca Canyon is not easy! A steep grade, loose gravel and no shade make this trail extremely difficult. But we did it, so it’s not impossible. Hiking Colca Canyon is absolutely stunning and you should not cancel your plans yet. You just need to get yourself ready. You will be hiking down for hours to get to the bottom of the canyon, and you need to be in very good physical condition. It’s not a bad idea to hit the gym at least a month before, to strengthen your quads before you do this hike. Also, try the StairMaster, and get used to walking with a bit of weight on your back. Bring enough clothes for a three-day trek. That way you don’t have to spend time renting or buying new stuff when you get to your destination. Be prepared for very high temperatures during the day, and cold nights in the canyon. You need to have proper layers in case it get’s chilly. Disclosure: This site contains affiliate links to products. We may receive a commission for purchases made through these links. You need money to buy cold drinks, pay for lodging or a mule to get you out of the canon unless you’re apart of a pre-paid tour. Even then, have some cash. Print a map, bring a GPS, or have a map on your phone. You just need a back up incase you lose one of these. It’s useful to bring a phone with you for light, and if you have an offline version of maps on your phone. In Peru there are two types of power plugs and sockets ( the one that looks like in the US, and one like in Europe). The Standard voltage in Peru is 220 V, which is higher than in the United States of America, which is 120 V. You can not use your US devices in Peru without a converter to protect your devices from frying. Power outages are common in Peru especially in remote area. If you want to charge your phone, camera batteries etc, you will need to bring a portable battery pack with you. Make sure you fully charge if before you leave on your hike. A small day backpack is enough for a 3-day trek. We were able to fit all our clothes, and camera gear in it. You don’t need to bring a lot with you. You will need good sun protection while hiking. This hike has no shad,e so we highly recommend to bring sunblock with good SPF. We love this Neutrogena sunscreen. It’s non greasy and it smells nice. You will need to bring a towel with you to Colca Canyon. There are numerous hot springs, and rivers where you can swim and relax. Guest houses typically don’t have towels so you will need to have something to dry off after shower. Microfiber towels are great for travel. They dry fast, are absorbent and portable. Defnitelly bring a first aid kit with you while hiking. You might get blisters, scratches, that you wil need to properly take care of so your wouds wont get infected. Even a simple blster can get badly infected, not to mention how miserable you will be hiking with a blister on your foot. If you run out of drinking water you can always refill your Lifestraw water bottle. We have been traveling with these bottles for years. You can refill them with water from a stream, or pond and the charcoal in the filter will kill any harmful bacteria. By using refillable water bottles, you reduce the amount of trash created from plastic bottle drinks. 12. 2L of water per person for the hike down. You can buy more once you’re in the canyon. Your lips will get fried and cracked from the sun, so don’t forget to add some SPF not only on your body but your lisps as well. Dry air and sunburns can crack your skin fast. We always travel with this ointment that helps with insect bites, sunburn skin and it’s also moisturizing. After the first day of hiking we were absolutely wiped. Painkillers relaxed our muscles and helped us sleep. Having painkillers with us really saved us! In case you have stomach issues or get a diarrhea. 18. Small bar of soap, travel size shampoo and conditioner. Use travel size containers for liquids like soap and shampoo. This will save you a lot of space in your backpack. These are also great when you are flying and you only have a carry on luggage. You should purchase travel insurance before you go on a hiking trip in Peru. Hiking can be dangerous. Stuff happens, and you don’t want to get stuck at the bottom of the canyon, injured and needing any assistance when you get out. It also gives you piece of mind. If something bad does happen you are covered and will get medical help. Make sure you read all the terms and condition of your travel insurance policy before you purchase it. Not all insurance companies are equal. World Nomads is the most popular health insurance for short-term travelers. Some of the biggest travel bloggers use it, and they have very good track record. We have being using IMG health insurance for years, and we are very happy with their services. You want to read more about travel insurance plans read this full article. Make sure your shoes are broken in, and you have enough toe room! You will be hiking down a lot, and the constant pressure on your toes could lead to getting black toenails. Yep, it happened to us (we both lost nails) and it was terrible because we still had 2 more days of hiking. The trail is covered with gravel and it’s very easy to slip and get injured, so make sure your shoes have proper soles. Having the right pair of socks is so important! Too thick socks can cause blisters, and too thin will make your foot slide around. Wool socks will keep you feet warm at night. It can get cold at night even during summer, having a pair of wool gloves really helps. We also wore them during the day to keep our hands from sunburns. Bring something war to keep you warm and dry at night. You don’t want to get hypothermia. Most guesthouses aren’t heated, but they provide warm blankets. We are a couple who is passionate about photography and film, so naturally we each had a camera, but we limited ourselves to the necessities. 1 camera, 2 lens each. No tripods. Our backpacks were already quite heavy, and we are glad we didn’t pack anymore. It would have been nice to have more, but this was more about hiking and surviving, than photography. You don’t need to bring food with you but if you like snacking bring some trail mix with you. The trail is covered in loose gravel. It is steep and narrow - which means danger. Make sure you know where you are stepping and pay extra attention when you start getting tired because that is when most accidents happen. Can you hike Colca Canyon without a guide? Depending on your hiking experience and personal preference you can hike Colca Canyon independently or with a guide. The trail is in general very well marked and we chose to hike without a guide, and it went smoothly. Trekking without a guide is the most economical and it will give you more independence. We saw many guided groups along the way and honestly their pace was a bit too fast even for people from those groups. We saw a few hikers struggling to catch up with their group. It is necessary to have a good map with you all the time. Have a printed copy as well as a digital version on your phone, or a gps. You can download free maps from Treeking Peru. Familiarize yourself with the map before the hike because you will be relying on your abilities to read the map in order to get in and out of the canyon safely. It is always a good idea to trek with a companion, so try to find a hiking buddy if you can. The hike is one of the most popular hikes in Peru, and you won’t be alone on the trail. Along, the way you will meet locals selling various goods, and you can also pay for a donkey to carry your bags up the hill. This option is especially nice when you are hiking out of the canyon. You can book your trek from the local tourist office in Arequipa. They offer a similar service, pick up form the hotel and transportation from town to the trail, but shop around for the best price. You can purchase the permit to hike Colca Canyon from the Official Tourism Agency in Arequipa. You will be staying in various guest houses in the valley. There aren’t enough guesthouses for every hiker, especially during the high season, and beds fill up quickly. Nobody will turn you away but in the worst-case scenario you might need to sleep on the floor or in a shared room. If you decide to hike the Colca Canyon your itinerary will be something like this: 3am-pick up from Arequipa. 3.5h drive-arrive in Chivay for breakfast. Stop at the view point to watch the Condors fly. Start your hike around 9am, either from Chivay or Cabanaconde. We started our hike in Chivay because we were told it's an easier hike down the canyon. Tips: If we had to do this a second time we would want to arrive the night before our hike and stay at a guesthouse near where the trail starts because by the time we started hiking we were already awake for 6 hours and the trail ahead of us was not easy. We also didn't start hiking until almost 10am and you want to start your hike as early as possibly, due to the strong sun and no shade on the trail. Colca Canyon is the 3rd deepest canyon in the world, so hiking down hill in one of the steepest trails is brutal. Funny enough, when we started the hike, we even said "oh this isn't so bad", only to cry a few hours after we said that. We couldn't wait for the torture to end. Yes, the first day felt like torture. Our knees were giving up and the sun was beating down, making the sandy trail very dusty. The loose gravel that covers the trail, was constantly slipping from under our shoes giving us a heart attack that we might fall off the cliff. When we finally reached "the bottom" and the suspension bridge, about 3 hours later, we were exhausted. We know that 3 hours of hiking doesn't sound that bad, but we would take a 15 hour moderate hike over this anytime. There were some locals waiting on the bridge for the thirsty tourists, with cold drinks at a very hefty price. At that point paying triple price for ice cold water, that would prevent us from over heating and fainting didn't sound so bad. After a short rest in the shade, we had to keep moving to find a comfortable bed for the night before everywhere got full. Not too far from the bridge, we found a nice, clean room with a bathroom and food for $18 in the small village of San Juan de Chuccho. 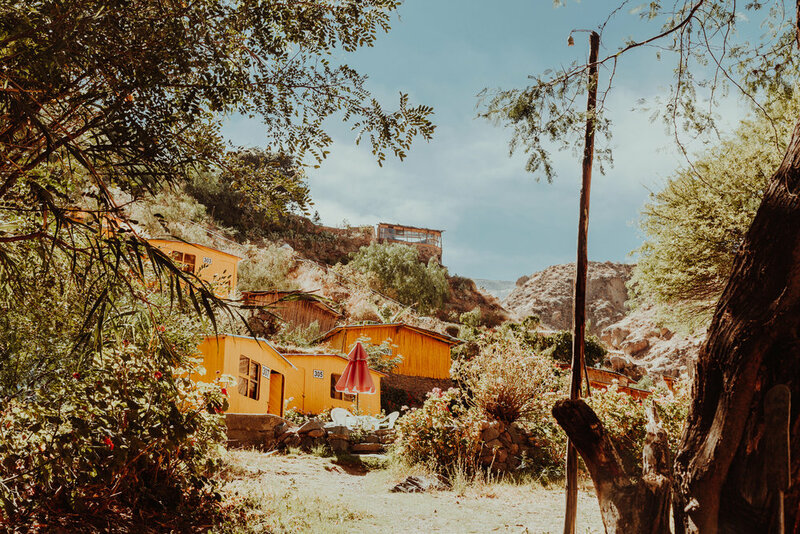 We stayed at La Casa de Roy Colca, and we highly recommend this guesthouse. The family who runs it, is incredibly sweet and we got know a bit about them. Apparently, with the little money they earn they managed to support their daughter and her language studies. The daughter is now living and working in Germany and studying to become a doctor. Wow! At dinner we met two German hikers, that concured how difficult the hike was. They decided to catch a local bus the next day instead of continuing with the hike. Quit honestly, this was also very temping to us. A good night of sleep made us feel much better and despite the sore muscles and bruised toes, we decided to continue our hiking adventure. The German hikers were gone to catch the bus before we ate our breakfast. We thanked our hosts for their hospitality and started our hike at 7am. We joined another hiking couple, with whom we explored the nearby villages selling honey, regional clothes, and even a healer who treats people with herbs concoctions. The second day would have been actually very pleasant if it weren't for our sore feet and legs and our new beautiful black toenails! Yep, our nails later did come off... Luckily, the trail was a mix of flat and just small uphills. We decided to skip Sangalle also know as "the Oasis". We've heard that the place became a sort of party town, with a bar and many backpackers, and being around loud people was the last thing we had in mind so we headed towards the Llahuar village and the hot springs. By 3pm we reached our final destination Llahuar lodge, which was the highlight of our trip. This place had natural hot spring pools, which worked like a miracle for our tired muscles. We spent the whole afternoon soaking in the hot pools and drinking cold beers. In the evening we had a warm dinner with other fellow hikers, who told us that we could catch a bus at a nearby town if we didn't want to hike anymore. (ask for directions at the Llahuar lodge). At this point, we felt a bit defeated and we told ourselves that we had enough and wanted to get out of the hot canyon. As planned, in the morning we hiked about 1 hour up the same hill we came from, to the nearest road to catch the bus. We waited with some locals for a while, but there was no sign of the bus. Unfortunately, the only bus that drives everyday through the canyon to Cabanaconde broke down, and nobody knew when the replacement was going to show up. We tried to stop a pick up truck, with plenty of space in the trunk, but the driver speeded up and all we saw was a cloud of dust after him. It was heartbreaking. Eventually, the replacement bus showed up, but it was going the opposite direction. We still got in, fearing that it would be totally full by the time it returned for us. Although we technically didn't hike the full 3 days like we planned, we knew it wasn't going to be a pleasant hike out on the exposed, hot and dusty trail. We are definitely not trying to discourage anybody from hiking in Colca Canyon, but you should definitely know that there is no shade on the trial, at least hiking in and out of it, and the path is very steep. Definitely bring a hat, sunscreen, and make sure you have plenty of room in your shoes, so you toes don't get smashed like ours. Depending on your exit route there, is also the option to hire a donkey to get out of the canyon. If you take care of yourself in the beginning with these easy tips, the rest you hiking advenure in the Colca will probaly be much more pleassant that ours was.